Photographic mock-up for an Alfred Stanley Johnson photomontage postcard entitled "Kickers." A boy wearing waders and holding a rifle stands with his arms outstretched and his face toward the sky. A dog is by his side; the two are standing by the shore of a pond. Artist's card no. 643. Refer to Image ID: 44637 for the final version of this composition, after the frogs have been added. 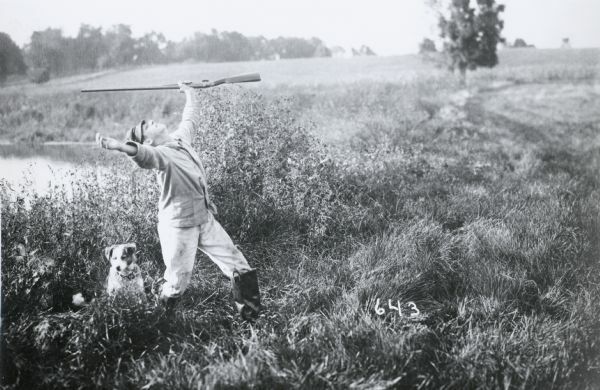 Note that the positions of the boy and the dog vary slightly. Waupun catalog no. P151. Made from print loaned by the Waupun Heritage Museum.